Today, Angel Feather unveils a new specialized G Guardian. CONT (GC): During a battle in which your opponent’s Vanguard attacks, if there are 2 or more face-down cards in your Damage Zone, this card gains Shield+10000, and if there’s 3 or more face-down cards in your Damage Zone, this card gains Shield+10000. For Today’s Card, we’re introducing a card from the 13th Booster Pack “Ultimate Stride” (on sale November 17th, 2017): 《Angel Feather》’s “Holy Seraph, Parasiel”. 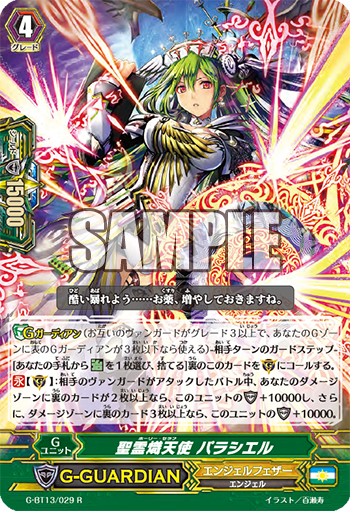 “Holy Seraph, Parasiel” is a specialized G Guardian for Vanguard attacks. During a battle in which the opponent’s Vanguard attacks, if you have 2 or more face-down cards in your Damage Zone, it gains Shield+10000! And, there’s 3 or more face-down cards in the Damage Zone, it gains an additional 10000 Shield. With no cost, you can have a Guard with a total of 35000 Shield. For example, for Rear-guard Attacks, you can defend with “Holy Seraph, Suriel”, and by using Counter Blasts with the skill of “Holy Seraph, Suriel”, you can be sure to activate the Skill of “Parasiel”. Deflect your opponent’s attacks with this powerful Guardian! We’ll be introducing more cards from the 13th Booster Pack “Ultimate Stride” in future “Today’s Card”! Please look forward to it!